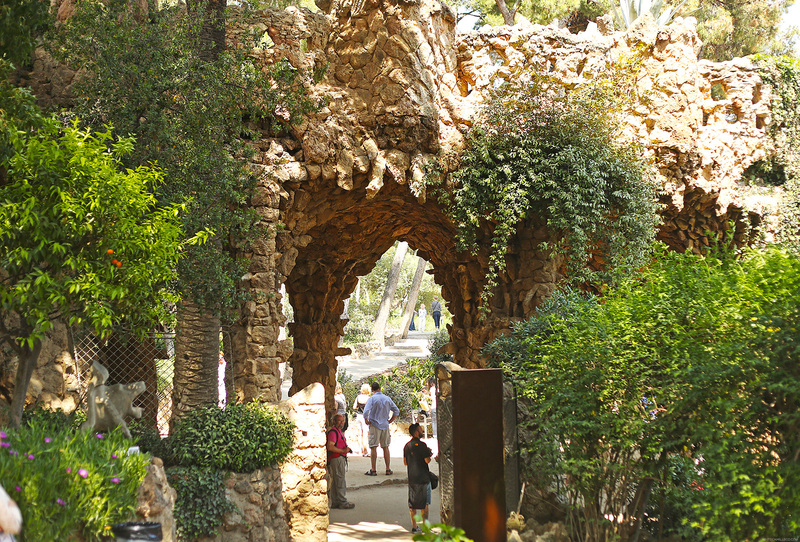 Park Güell was intended to be an estate for well-off families. 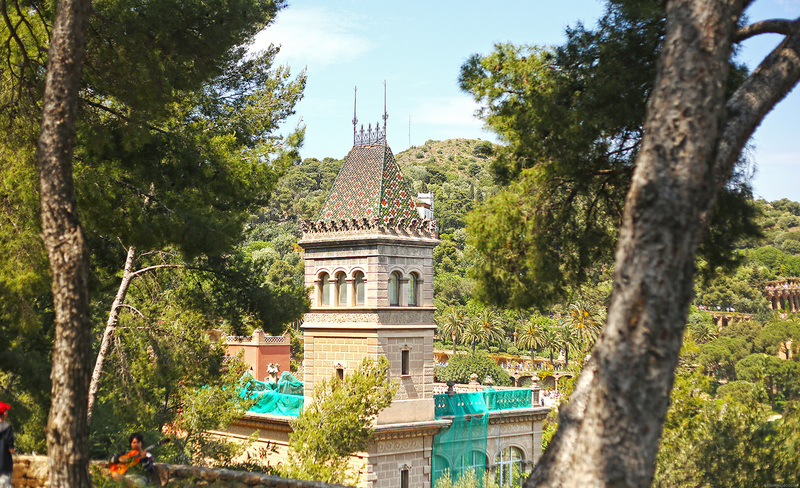 When Eusebi Güell bought the site located on a hill with little vegetation and few trees called Muntanya Pelada (Bare Mountain) in the 1900s, he wanted to recreate the selective British residential estates and entrusted the development and urban-planning of the entire estate to Antoni Gaudí. 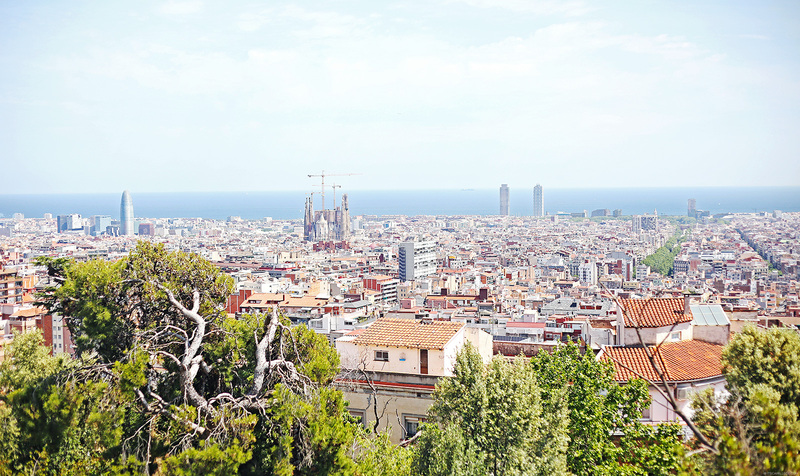 The location was unbeatable with a splendid view over the sea and plain of Barcelona. The estate made provision for 60 triangular plots with a complex network of paths, viaducts and steps to cope with the steep topography of the terrain. Gaudí was doing a fantastic job providing practical solutions for would-be residents while aspiring to achieve a total work of art. 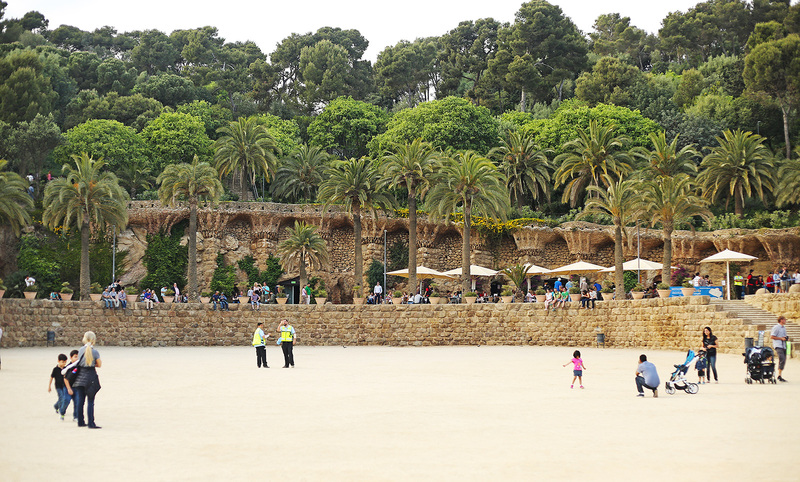 However, by 1914, Güell chose to halt construction work on the project because no one was buying. Although much has been done on the land and the estate is like no other, the conditions of plot acquisition, the exclusive nature of the estate and the lack of proper transport to the estate made the project a commercial flop. 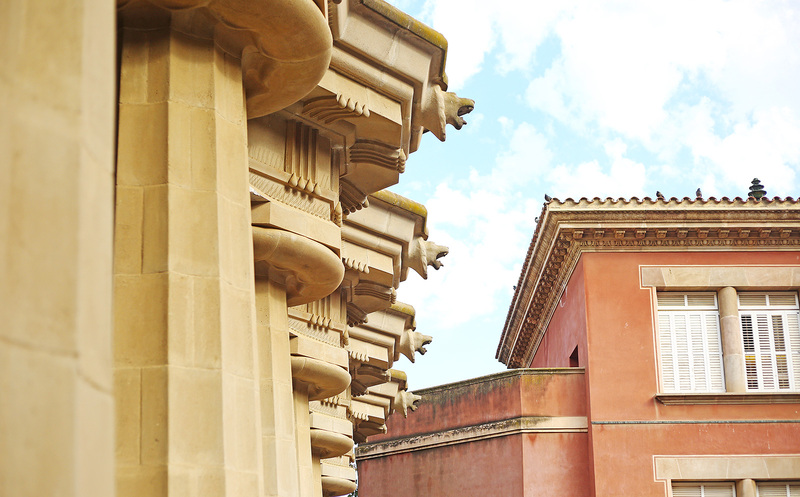 Eusebi Güell’s heirs offered the estate to the Barcelona City Council which decided to acquire it in 1922 and opened it as a public park four years later. 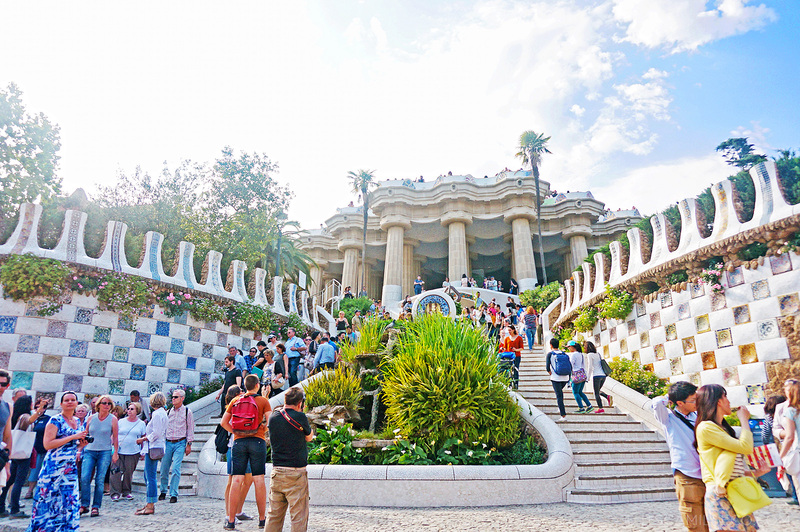 Boohoo for Eusebi Güell but yay for us because we get to see more of Gaudí’s work! 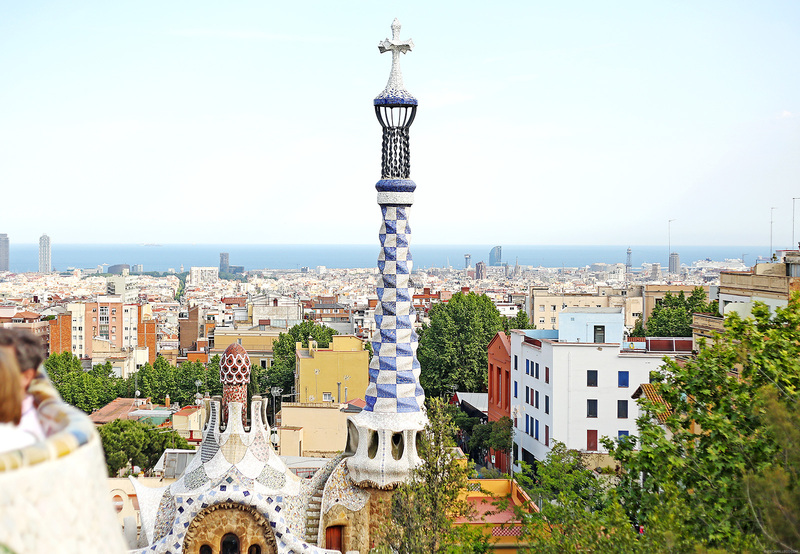 To get to Park Güell, you can either ride the public bus or the metro. Sandy and I took the metro because we wanted to save time. We took the green line or L3 and got off at the Lessep stop. It was easy finding Park Güell upon exiting the metro. We just followed the street signs and everyone else before us. LOL! Expect a good 15 minute walk to Park Güell. On the way, I found this tempting ad by one of the shops in the area. How cute! We’re finally entering Park Güell. If you used the Metro like us, you’ll be starting from the top of the hill going down so you still have a pretty long walk ahead of you before you get to the main entrance where the tickets are sold. I didn’t know this though because when I first visited the place back in 2007, admission was free. Now, tickets cost 8 Euros for adults (7 Euros if you buy online) and you’re only allowed to enter on your assigned time slot. Once you’re in though, there’s no time limit. You’re free to roam around for hours and hours. From this point, you can already see the monumental zone of the park, the area that requires the entrance ticket. Do you see the path lined with coconut trees ahead? That’s still part of the free zone where tourists can roam around while they wait for their time slot. As I’ve mentioned, the park is situated on a hill with a beautiful view of Barcelona. You can even see Gaudí’s La Sagrada Familia and the bullet shaped building called the Torre Agbar (which will soon become the Grand Hyatt Hotel) from here. This is the house of Gaudi located outside the monumental zone. He moved into the estate in 1906 and lived here with his family until 1926. 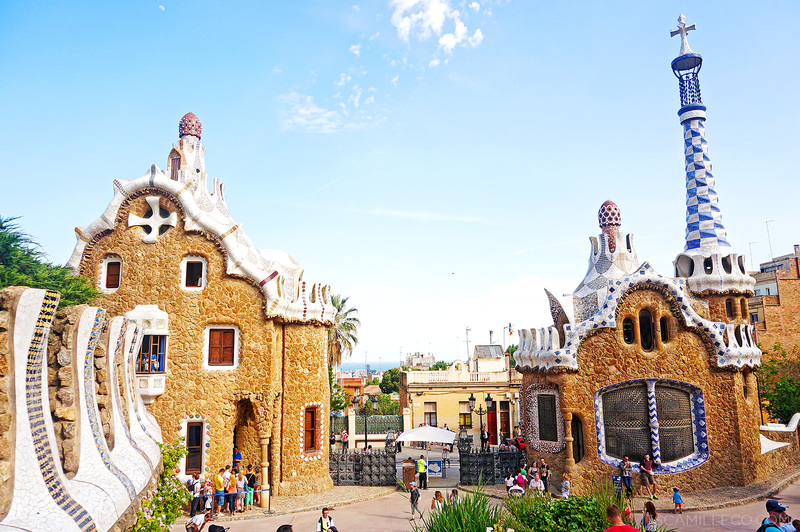 Now, it’s the Gaudi House Museum or Casa Museu Gaudí where several of Gaudí’s original works are displayed. There is a separate entrance fee for this. We’re finally at the monumental zone! The iron gate that you see here is the main entrance to the park found along Carrer D’Olot. It was brought from Casa Vicens, an early work by Gaudí. To either side of the gate are the two pavilions that formed the porter’s lodge of the old estate. 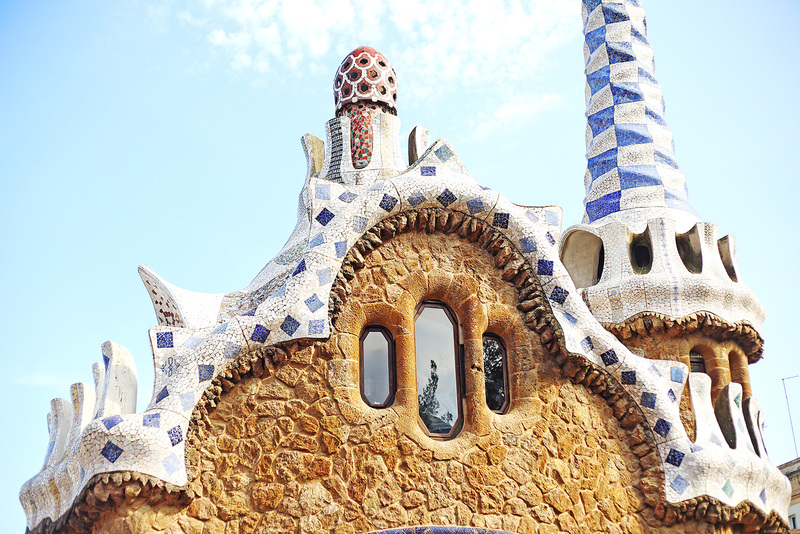 Both have unique roofs, clad with trencadís–a decorative system much loved by Gaudí where one makes use of small pieces of broken tiles to cover surfaces. The one on the left is the Casa Del Guarda, built between 1901 and 1903. 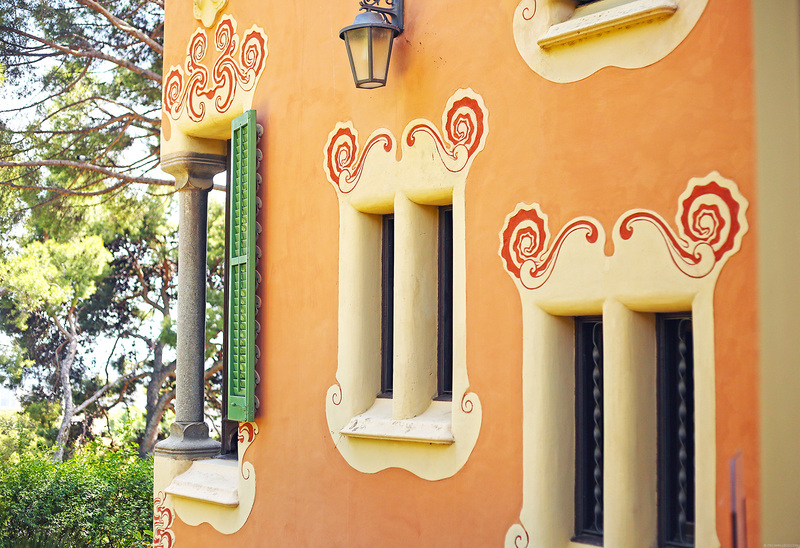 It’s one of the few examples of modest dwellings created by Gaudí. Now, it’s part of Bareclona History Museum. The one of the right with the cross is also a porter’s lodge. It was intended to be a place to receive visitors of the estate, with a spacious waiting area. Now, it serves as the park’s souvenir shop. Don’t both structures look like gingerbread houses? Or am I just hungry? Here’s a closer look at the roof clad with trencadís. Isn’t it something else? I wish I had Polly Pocket houses like this! LOL. Across the porter’s lodge and iron gates is the famous flight of steps. This is the exact area where I shot my Mango It Girl photo! It’s the first thing you’ll see coming from the main entrance. The steps start from the entrance square and ascends to the Hypostyle Room. 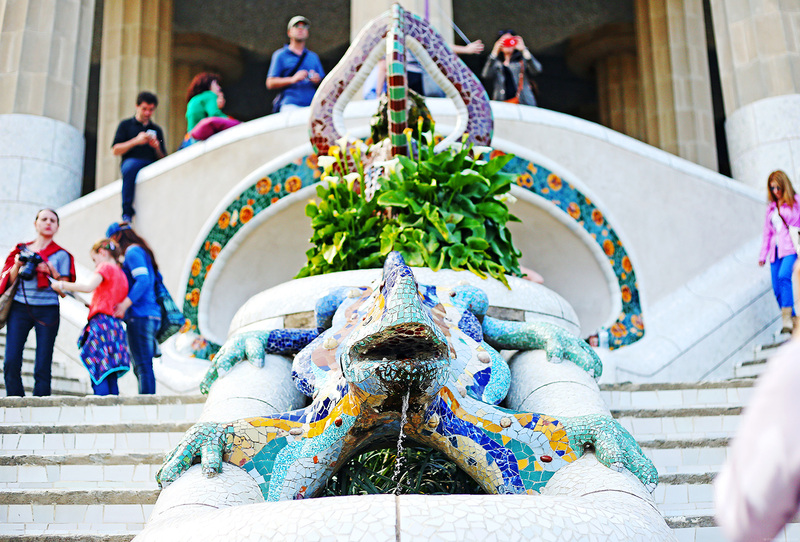 The flight of steps has so many details you shouldn’t miss like this fountain in the form of a snake’s head above the shield of Catalonia. As you can see, it’s covered in tiles, like most of the park’s details. This technique of adhering layers of tiles is a traditional technique of construction called Catalan vault used by Gaudí and other Catalan architects within the modernisme movement. 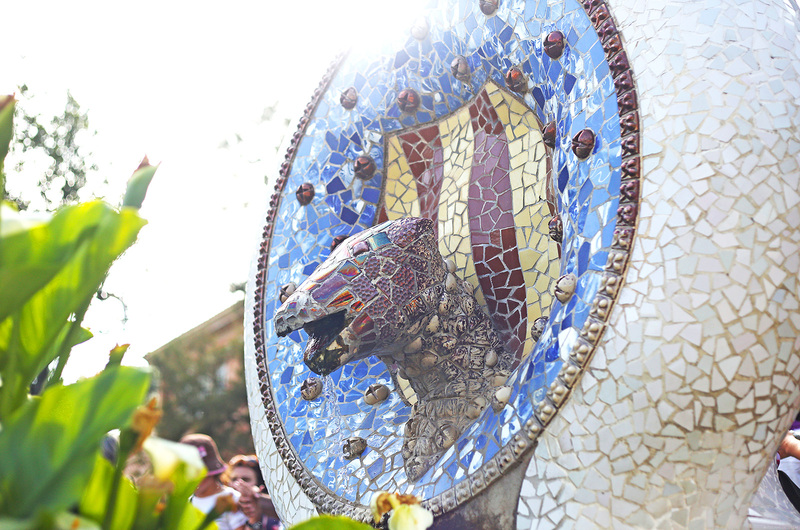 Above the snake head fountain is a brightly coloured salamander called “el drac” (the dragon). Behind it is a tripod that appears to be formed by 3 snakes (the part with the purple tiles). Do you see the floral tiles behind the snakes? Under that is a circular bench that offers a fine view of the entire entrance. Tourists can sit and rest there for a few minutes while taking in the picturesque surroundings. The porter’s lodge really looks like a gingerbread house right? I’d like to believe Gaudi is a little whimsical. He always makes use of odd shapes and curves. Never boring. If I’m not mistaken, this is the portico of the washerwoman, found at the gardens of the former farmhouse, Casa Larrard. The portico is made from unpolished stone. Its exterior is a series of buttresses, one of which depicts a rough caryatid known as the Washerwoman. Too bad I wasn’t able to take a photo of the Washerwoman! I was too excited to take ANTM-inspired photos! You can clearly see how Gaudí was inspired by nature, much like his La Sagrada Familia. It looks as if I’m trapped inside a tree. This is the Hypostyle Room or the Sala Hipóstila, a covered area with 86 striated columns in the Doric style. It was intended to be a market for the estate among other uses. The photo before this shows how it’s exterior looks like, lined with gargoyles and its edges sloping in a curvilinear fashion. The contrast between the two is really interesting–classic columns versus the unique edges. This is how the ceiling inside the Hypostyle room looks like. 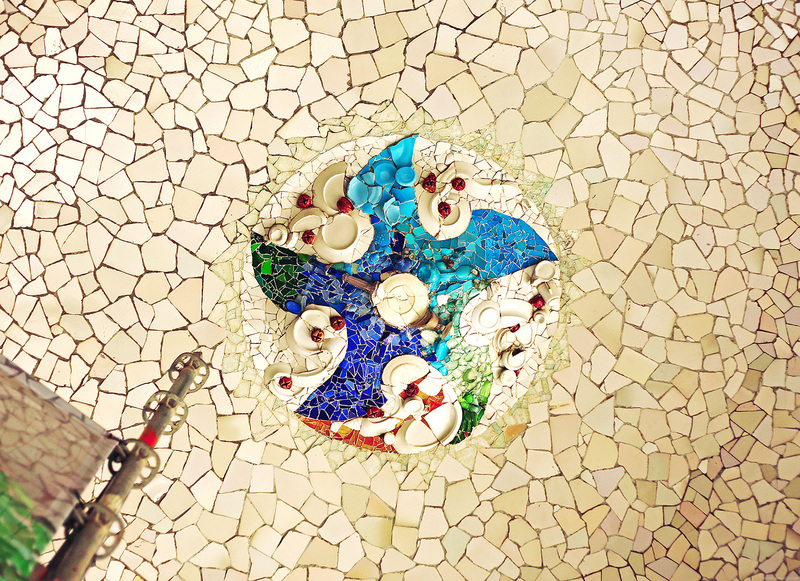 It’s amazing how Gaudí thinks of all these little details! Here’s a wider view of the curved edges I was talking about. 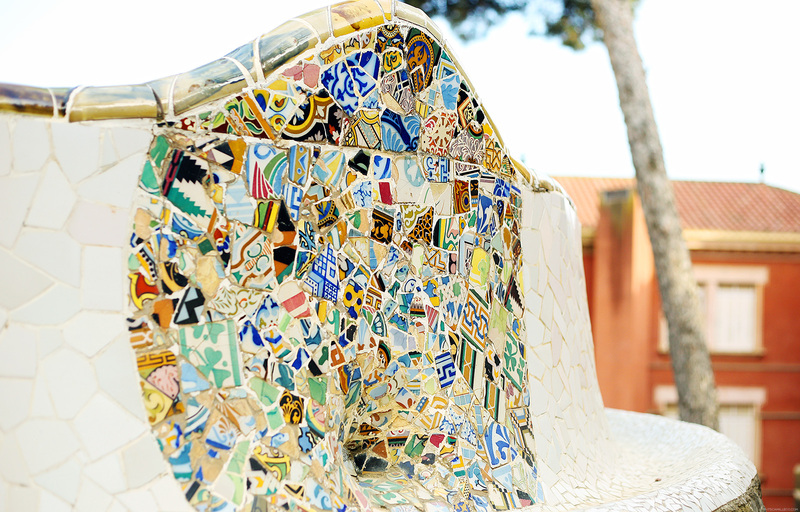 On top lies the main terrace surrounded by the Banc de Trencadís, a tiled bench curved all over its perimeter to the form of a sea serpent. It’s one of the main attractions of the park because the view from here is amazing! Take a closer look at these colorful-tiled mosaics. 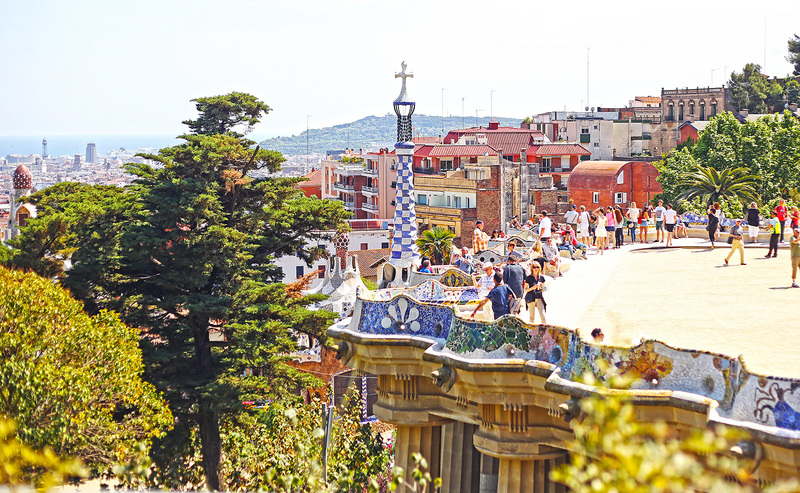 The view for the main terrace consists of not only the park but the rest of Barcelona as well. Imagine if people actually lived here! What a view to wake up to everyday. The main terrace actually serves a greater purpose than just relaxation and recreation. According to Lonely Planet, “this giant platform was designed as a kind of catchment area for rainwater washing down the hillside. The water is filtered through a layer of stone and sand, and it drains down through the columns (I’m presuming these are the columns at the Hypostyle room) to an underground cistern.” You’d think that if you see a place like, everything was just created for aesthetic purposes but no, Gaudí is a true genius! I’ve always been a fan of Gaudí. Ive visited his other works–La Sagrada Familia, Casa Batlló and La Pedrera, and each time I got blown away. I mean this wasn’t even my first time in Park Güell and look at me, I’m still exploring the place with my mouth half open in awe. If you ever go to Barcelona, make sure to visit at least one of his creations. I promise you it’ll be a great experience! One you won’t forget. It`s lovely! the description and the pics took me directly there, i just love that place! nice post Camille!! Glad you read this one! :) Thanks Grace! Been away. Ah! Catch up! Catch up! Wow! The designs are so cool. Agree, it’s not boring. It goes to show that it’s okay to break some rules when it comes to designing. If only Eusebi is a little more patient, he’ll be earning I can’t imagine how much. This place is worth the spending. If the buildings weren’t buildings at all I could have ate them! They look like yummy foods that keeps my mouth watering while reading this for I really really love sweets~ :D The whole pictures was really amazing! You are so great in storytelling. 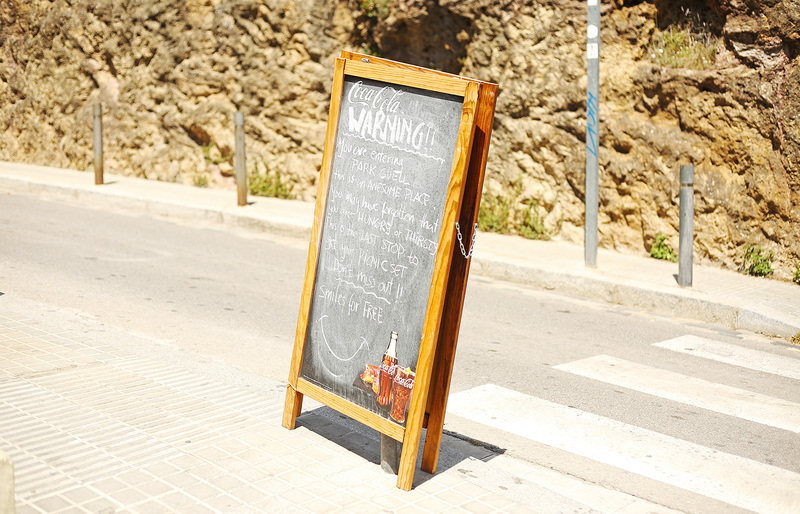 I enjoyed reading this article and suddenly want to travel to Barcelona because of this post. Congratulations on your app, already downloaded and currently exploring it. Awww thanks Clariss. I’m really not all that but thank you! Yes, Miss Camille, those lodges totally look like gingerbread houses. I too am a Polly Pocket collector and if I had one of these, I would never ever ever get tired of it. 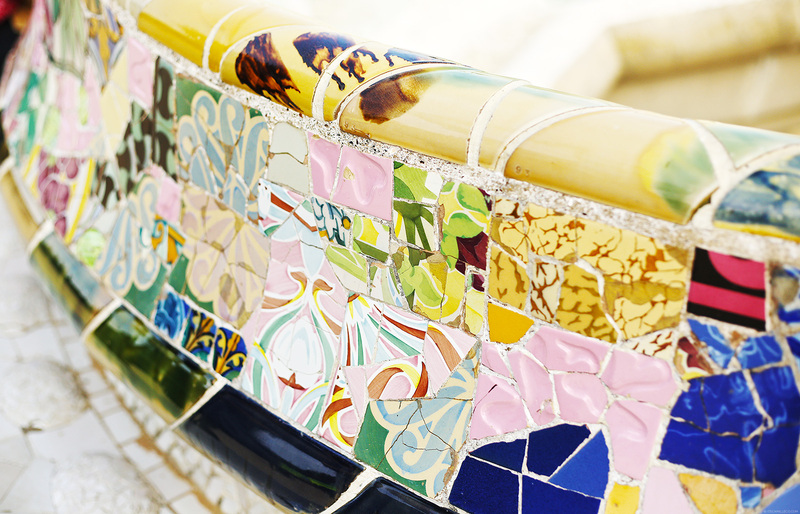 (like, ever) Gaudi’s work is truly a tribute to the combination of aesthetic and practical. That filtering system you mentioned had me more than amazed. In the 21st photo, the ceiling of the Hypostyle room, are those pieces of plates combined with the tiles? That part is GENIUS! I thought you couldn’t add more to make this place a pantheon to modern European design, but still, the artistry leaves so much wonder in the heart as well as the eye! 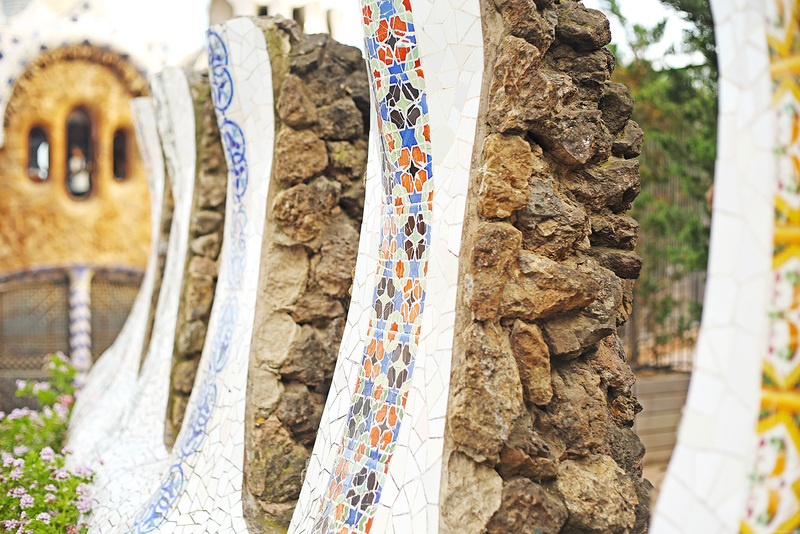 All the details of Park Guell are splendid, Miss Camille! I had a good time learning about it from all the information you wrote here. The tilework all around the Banc de Trencadís fascinates me. I could stay there all day looking through the many colorful patterns. Are the curving parts of the said Banc the viaducts you mentioned? The whole structure depicts so much artistic motion for something that has stood right there for hundreds of years. I mean, the depictions of the tile snakes and dragon alone must’ve taken months to finish. To let those critters have their own niches in the architecture is a gift to us globetrotters and wannabe globetrotters. 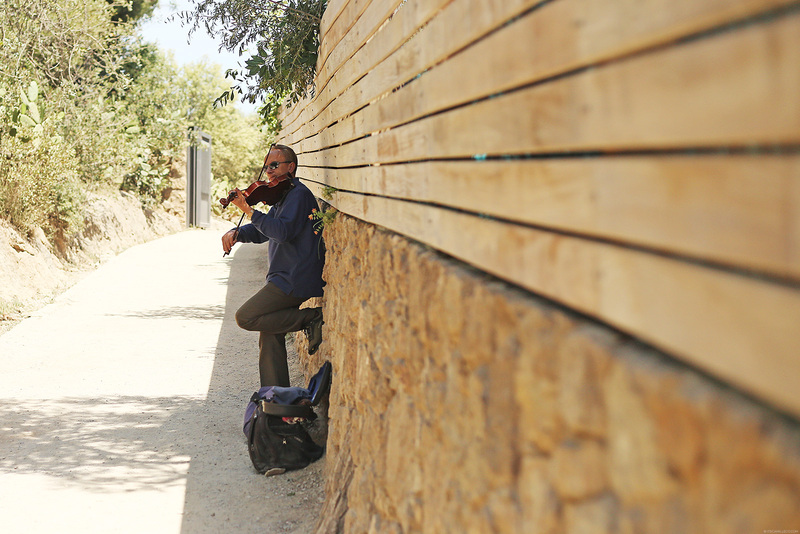 Thank you for that photo of the man playing the violin. :-D Made me miss my orchestra days! Oh, and did you get one of those picnic sets advertised on the sign you showed? 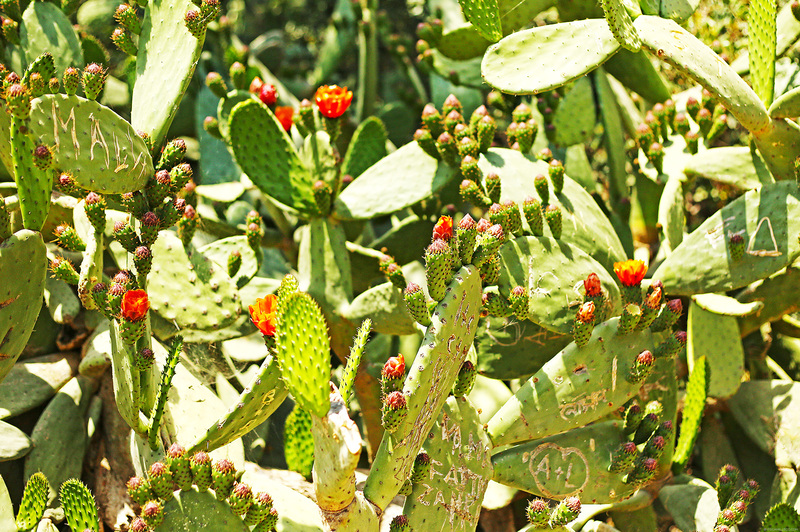 Cool photo of the cacti plants too. I was trying to spot the pods ready to bloom. I didn’t know such flora grew in Barcelona. And, I’m glad you were able to revisit your Mango It Girl photo shoot area. How different was it from last time you came? Oh, and your pose for the 8th to the last photo; it looks like you just awakened from a sweet slumber inside Gaudi’s magnificent structure, and you are about to behold the city for the first time. It’s exactly the same! That’s how good they are at taking care of the place. :) I wish you’ll get to go here some day. I’m sure you’ll love it more in person! Ive always wanted to see the works of gaudi in person. Your post is making me ache for spain!! So amazing. Plus, i really love the pink top. Daring yet subdued by the blazer. Fab! Wow how were you able to remember all those infos!! hahaha!! Such an amazing place <3 I hope I can visit Barcelona too in the future and make use of my Spanish haha! Your travel posts are my favorite! Place looks amazing! Thank you Cathy! :) It really is! Cams stop it please… Just kidding. Seriously I want to go to Barcelona! Places like this that has so much art and imagination to them attracts me so much. It’s kind of like equal to the attraction I feel for old cities and architecture. BARCELONA you’re in by bucket list! I’m not sure if you’ve read my comment over at Instagram about the buildings you said that looked like gingerbread houses but I’ll mention it here anyway… When I saw your Instagram photo the buildings reminded me of the “edible” house in the children’s story Hansel and Gretel. Although luckily for this place there’s no witch to ran from and hide. Hahaha. More Cams please. I really love these posts. Sa tingin ko nga lahat ng lugar sa travel dairies mo nasulat ko na ata sa bucket list ko. Grabe. Parang kelangan ko na tumama ng lotto. LOL! Barcelona!!! I wanna go there someday! I am a big fan of Gaudi’s works! I am sure you enjoyed Gaudi’s works in Barcelona Ms. Camille :) I wrote a comment before reading the whole entry, I just want to say how I really love Barcelona! Lucky Sandy. She got to travel with you! Waaaa, i envy her! Sana may “TRAVEL WITH ME?” Soooooooooon gaya ng dinner with me! Haha. Anw, super love the views! And the shots. Feels like Im in Barcelona too! Hahahaha. Beautiful photos! I’ve been there too one time! Gaudí’s designs are so magical! wow Barcelona! I so love this place even I don’t yet go there, (sana may PH-SPain Bilateral Meetings to convene there) you captured all the beautiful details Cams. Antoni Gaudi is a God’s architect indeed. I also like the distinctive style of him na may pagka-nature and religion.I wish talaga I could go there. btw, Cams, have you visit the The Castle of the Three Dragons? is it beautiful? Lovely photos Camille :) nabitin ako! more please? :))) I was wondering who took your photo with your friend? And most importantly, hindi ka ba naiinitan sa blazer mo? hahaha! Seeing your photos, it looks like it’s hot in Barcelona. I can tell that it’s your favorite kc every time you go to Europe palagi kasama eh hahaha!